Here are three views. The first one comes from the Alliance of Concerned Teachers followed by the opinion of the Kabataan (Youth) party list. These two are capped with a brief exchange of views I had on Facebook with someone in the Philippine government. 1. HB 6455 continues the decades’ long trend of prioritizing debt servicing over education, health and sanitation, housing, and other social services. A total of P360.4 billion is allocated to the debt burden, comprising 17.9% of the P2.006 trillion proposed budget. That’s larger than the combined budget for education and health. The priority given to debt servicing continues to be the main reason for the gross underfunding of social services by government, resulting in the deprivation of basic services to generations of Filipinos. Even the Department of Education budget, which has the biggest budget among all line agencies at P292 billion, will not be able to provide for the needs, particularly of K to 12, touted as the banner education reform program of this administration. A mere P1.6 billion is allocated for the universal kindergarten program, which means that the Department of Education will continue to employ over 23,900 volunteer kindergarten teachers with a monthly pay of only P3,000 to P6,000 per month. How can this administration countenance such gross exploitation of teachers? 2. HB 6455 perpetuates the underdevelopment of domestic industry and agriculture. The Aquino administration continues to look to foreign investment and the overseas labor market as the main drivers of employment. Nowhere is this more evident than in the pitifully inadequate budget of the Department of Trade and Industry, particularly the allocation for Micro-, Small, and Medium Enterprises. MSMEs account for over 60 percent of jobs generated by the economy annually. Yet compare the allocation of a measly P1.2 billion for MSME support to the massive P44.3 billion allocation for the Department of Social Welfare and Development’s Pantawid Pamilyang Pilipino program. Clearly, this administration prefers short-term dole outs over long-term employment and the strengthening of the domestic economy. 3. HB 6455 infringes upon the rights of public sector employees, including teachers and non-teaching personnel, to decent salaries, job security, and collective bargaining. a. HB 6455 does not provide for a salary increase in 2013. Historically, government has, since the initial implementation of the Salary Standardization Law in 1989, imposed a freeze on salary increases right after the implementation of a round of pay hikes (typically lasting 3 to 4 years but as long as 6 years in the case of the Arroyo administration). This is unlike the private sector, where the minimum wage is reviewed annually. We are concerned that the Aquino administration will continue this pattern, resulting in the erosion of salaries and decline in living standards of public sector employees. b. HB 6455 perpetuates the large-scale contractualization of government personnel providing essential and front-line services. The proposed budget does not provide for the regularization of hundreds of thousands of contractual positions in the bureaucracy. In the public education sector alone, for instance, there are over 49,000 contractual teachers employed by Local Government Units; over 23,900 volunteer kindergarten teachers employed by the Department of Education, and over 16,000 contractual faculty employed by SUCs. The Department of Health intends to deploy 22,500 contractual nurses. In short, over 111,400 contractuals in public education and health alone. The vast majority are grossly underpaid and have no employer-employee relationship with government and are thus deprived of basic benefits. Hand in hand with contractualization, the proposed budget also maintains a freeze on the hiring of new personnel in many agencies in the name of rationalization. Notable in this regard is the lack of new plantilla positions for non-teaching personnel in the Department of Education, despite the fact that it will hire 61,510 new teachers next year. c. HB 6455 further undermines the public sector’s right to unionize and to collective negotiation. Not only does HB 6455 not have a provision on the funding of Collective Negotiation Agreement Incentives, but it also signals the Aquino administration’s intent to, as the President put it, “move away from across-the-board incentives” through the introduction of Performance-Based Incentives, for which P9.97 billion is allocated. This introduces a competitive model that lets agencies and employees vie against each other for one-time cash incentives. This is intended to undermine the model of collective negotiation based on solidarity of interests upon which public sector unionism is based. 4. HB 6455 does not have adequate safeguards for the protection of human rights and the ending of impunity enjoyed by human rights violators. The budget can be a powerful tool for influencing policies and behavior in government institutions. For the past two years, this representation has advocated that the release of certain operational funds of front line units of the Armed Forces of the Philippines be tied to their human rights record. HB 6455 contains no such provision along these lines. 5. HB 6455 contains lump sum funds at the disposal of the Office of the President. Despite Malacañang’s declared aversion for lump sum funds, the Office of the President has reserved for itself a number of lump sum allocations. A notable example of this would be the P5.0 billion PAMANA fund, a Presidential pork barrel tucked into the budgets of eight agencies, to be dispensed at the discretion of the Office of the Presidential Adviser on the Peace Process. And the election fever has indeed pervaded even the pages of one of the most important pieces of legislation that Congress passes annually – the General Appropriations Bill. No less than the Aquino administration has branded the P2-trillion national budget for 2013 as an “empowerment budget” that will benefit the people, supposedly targeting the poor and the marginalized. Yet, as discussions in Congress have revealed, the budget that was passed on third reading today is loaded with more pork, dole-outs, and fat bonuses. It would even be more appropriate to call it an “election budget” which will benefit P-Noy’s coterie of political butterflies, especially those in the ruling Liberal party. The Department of Education, as expected, will receive the biggest share in the budget among all government agencies. The agency’s P292.7 billion allocation, however, is way below the P334 billion proposed budget that is required for the successful implementation of the K-12 program in the next school year. The Department of Public Works and Highways will receive the second biggest allocation in the government budget after DepEd, with a total of P152.9 billion. The government dubbed DPWH as the overall agency in charge of all government infrastructure projects, a suspicious move especially as the national elections fast approaches. At first glance, one might not see anything sinister in this categorization. But we want to ask – did the government centralize all infrastructure projects to one agency to make it more convenient for its cohorts to receive kickbacks from overpriced and anomalous projects? Instead of talking to various line agencies, politicians will now only deal with DPWH. One agency for the spoils, one-stop-shop for corruption deals. And it goes more blatant from here. The budget that we are about to pass will allow a “nationwide hiring spree,” as it includes over P60 billion to fund the hiring of over 160,000 new state workers. This only means that, despite the Palace’s repeated denials, the government did unnecessary underspending in the past two years and now has the funds for a hiring binge in time for the elections. The government doesn’t stop here. The Aquino regime will try to win the people’s votes with additional funds for the Conditional Cash Transfer program. Instead of directly investing in social service programs, the government has decided to expand the CCT dole-out by increasing its allocation in the 2013 budget from P39 billion to P44 billion. Meanwhile, the PAMANA peace and development program, which is the other less controversial CCT of the government in remote villages, was given a budget of P5 billion compared to this year’s P1.7 billion budget. While the budget for PAMANA was included in the allocation for several other government agencies, the P5-billion fund remains to be under the Office of the Presidential Adviser on the Peace Process’ control. When we asked OPAPP what is the extent of their role in handling these funds, they said that they will only monitor and provide oversight. Yet the departments with PAMANA allocation are not sure where to use these funds, making it appear that OPAPP will directly control this budget. The Aquino regime should not brag about this so-called “empowerment budget.” This holds true, even for the budget of state universities and colleges. 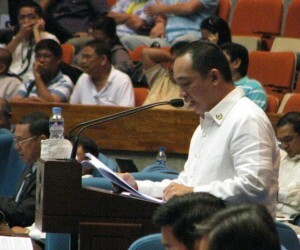 Malacanang and DBM should not brag the reported increase in the SUCs budget. The P37.1 billion proposed budget is still grossly insufficient if we consider the total proposal of SUCs for 2013, which adds up to P54.6 billion. What’s more, the P37.1 billion proposed budget is still grossly insufficient if we consider the total proposal of SUCs for 2013, which adds up to P54.6 billion. The DBM-proposed budget for SUCs is only 67.98 percent of the total requirement of 110 SUCs. DBM data also reveal that the P37.1 billion DBM-approved budget for SUCs next year is actually P17.5 billion less than the actual need of SUCs. The 2013 national budget marks the height of Aquino’s deception. Padding the budget in a manner which does not address the needs of the poor and the marginalized is not what the youth demanded. The youth will not accept this cover-up budget. The youth will not accept this electioneering scam. Even with the passage of the 2013 General Appropriations Bill, we will continue the fight for sufficient state subsidy – from the august halls of Congress up to the streets. Angel de Dios: In my perspective, education reform cannot take place if we do not address first the plight of teachers. When teachers are preoccupied with fighting for just salaries, I do not think any reform would work at all. No changes in curriculum will help if teachers are unable to support their families. The second point is that curricular reform in basic education requires leadership and direction from higher education. This will not take place without an increase in research productivity. Research must always involve peer review so that the data that will be used to form education reform measures are reliable. Anonymous: I don't think the Philippines public school teachers are of the sorriest lot among our country's professionals. Soldiers and policemen who are required to give off their lives in battlefields and most adverse circumstances are paid much less. And so are midwives and nurses who are more physically burdened. The private school teachers are even most disadvantaged: very few have tenures, many extend teaching hours and related work without overtime pay, and I know of some teaching in ma-pormang schools whose salaries and benefits are lower than the janitors, drivers and messengers of my former office. But they make less noise and their dedicated work shows greater internal efficiency. With higher salaries, allowances and other fringe benefits provided by both local and national government, they are the envy of private school teachers and hence, their heavy exodus to the public schools. Based on the patterns of salary increases and rate of radical politicization, public school teachers will continue to complain and cry of poverty even if you increase their salaries five times more. Angel de Dios: Your comment highlights the need for research and data. You and I can provide anecdotes that support our own notions. If we are willing to compare Philippine basic education against those of other countries - we must do the same with teachers' salaries and working conditions. Anonymous: Oh yes, we have the comparative data not only the pay scale but also the progress towards more bearable working conditions. But we must also understand the fiscal position of our government and the competing priorities which are too many. WE cannot make everyone happy, certainly. Angel de Dios: The costs of a failed basic education program are serious. It leads to great social inequity. Addressing the education problems is within reach. But the longer the government ignores the right solutions, the worse the problems become. It becomes even more expensive. Anonymous: I fully concur, Angel. I think the current government is a reforming government that wishes to address that.The K-12 is one such massive and intertwined solution to economic, employment and other social problems. That's why we have decided to invest in it even as we are simultaneously attending to the other problems of basic education. But as much as we would like to move that fast, we cannot due to fiscal and other constraints. Angel de Dios: As pilot cases, efforts are worthwhile. On a national scale, however, the situation is markedly different. Effort is not enough. The wrong reform will cause serious damage and remediation is close to impossible. Mistakes will make the predicament more costly. Education should not be used as a political football. It must come from the ground, initiated by the teachers, and not dictated by politicians.